For the language, see Maasai language. For the Apache warrior, see Massai. The Maasai are a Nilotic ethnic group inhabiting northern, central and southern Kenya and northern Tanzania. They are among the best known local populations internationally due to their residence near the many game parks of the African Great Lakes, and their distinctive customs and dress. The Maasai speak the Maa language (ɔl Maa), a member of the Nilo-Saharan family that is related to the Dinka, Kalenjin and Nuer languages. Some have become educated in the official languages of Kenya and Tanzania, Swahili and English. The Maasai population has been reported as numbering 841,622 in Kenya in the 2009 census, compared to 377,089 in the 1989 census. The Tanzanian and Kenyan governments have instituted programs to encourage the Maasai to abandon their traditional semi-nomadic lifestyle, but the people have continued their age-old customs. Many Maasai tribes throughout Tanzania and Kenya welcome visits to their villages to experience their culture, traditions, and lifestyle, in return for a fee. The Maasai inhabit the African Great Lakes region and arrived via the South Sudan. Most Nilotic speakers in the area, including the Maasai, the Turkana and the Kalenjin, are pastoralists, and are famous for their fearsome reputations as warriors and cattle-rustlers. The Maasai and other groups in East Africa have adopted customs and practices from neighboring Cushitic-speaking groups, including the age set system of social organization, circumcision, and vocabulary terms. According to their oral history, the Maasai originated from the lower Nile valley north of Lake Turkana (Northwest Kenya) and began migrating south around the 15th century, arriving in a long trunk of land stretching from what is now northern Kenya to what is now central Tanzania between the 17th and late 18th century. Many ethnic groups that had already formed settlements in the region were forcibly displaced by the incoming Maasai, while other, mainly Southern Cushitic groups, were assimilated into Maasai society. The Nilotic ancestors of the Kalenjin likewise absorbed some early Cushitic populations. The Maasai territory reached its largest size in the mid-19th century, and covered almost all of the Great Rift Valley and adjacent lands from Mount Marsabit in the north to Dodoma in the south. At this time the Maasai, as well as the larger Nilotic group they were part of, raised cattle as far east as the Tanga coast in Tanganyika (now mainland Tanzania). Raiders used spears and shields, but were most feared for throwing clubs (orinka) which could be accurately thrown from up to 70 paces (appx. 100 metres). In 1852, there was a report of a concentration of 800 Maasai warriors on the move in what is now Kenya. In 1857, after having depopulated the "Wakuafi wilderness" in what is now southeastern Kenya, Maasai warriors threatened Mombasa on the Kenyan coast. Because of this migration, the Maasai are the southernmost Nilotic speakers. The period of expansion was followed by the Maasai "Emutai" of 1883–1902. This period was marked by epidemics of contagious bovine pleuropneumonia, rinderpest (see 1890s African rinderpest epizootic), and smallpox. The estimate first put forward by a German lieutenant in what was then northwest Tanganyika, was that 90 percent of cattle and half of wild animals perished from rinderpest. German doctors in the same area claimed that "every second" African had a pock-marked face as the result of smallpox. This period coincided with drought. Rains failed completely in 1897 and 1898. The Austrian explorer Oscar Baumann travelled in Maasai lands between 1891 and 1893, and described the old Maasai settlement in the Ngorongoro Crater in the 1894 book Durch Massailand zur Nilquelle ("Through the lands of the Maasai to the source of the Nile"): "There were women wasted to skeletons from whose eyes the madness of starvation glared ... warriors scarcely able to crawl on all fours, and apathetic, languishing elders. Swarms of vultures followed them from high, awaiting their certain victims." By one estimate two-thirds of the Maasai died during this period. Starting with a 1904 treaty, and followed by another in 1911, Maasai lands in Kenya were reduced by 60 percent when the British evicted them to make room for settler ranches, subsequently confining them to present-day Samburu,Laikipia,Kajiado and Narok districts. Maasai in Tanganyika (now mainland Tanzania) were displaced from the fertile lands between Mount Meru and Mount Kilimanjaro, and most of the fertile highlands near Ngorongoro in the 1940s. More land was taken to create wildlife reserves and national parks: Amboseli National Park, Nairobi National Park, Maasai Mara, Samburu National Reserve, Lake Nakuru National Park and Tsavo in Kenya; and Lake Manyara, Ngorongoro Conservation Area, Tarangire and Serengeti National Park in what is now Tanzania. Maasai are pastoralist and have resisted the urging of the Tanzanian and Kenyan governments to adopt a more sedentary lifestyle. They have demanded grazing rights to many of the national parks in both countries. The Maasai people stood against slavery and lived alongside most wild animals with an aversion to eating game and birds. Maasai land now has East Africa's finest game areas. Maasai society never condoned traffic of human beings, and outsiders looking for people to enslave avoided the Maasai. Essentially there are twenty two geographic sectors or sub tribes of the Maasai community, each one having its own customs, appearance, leadership and dialects. These subdivisions are known as 'nations' or' iloshon'in the Maa language: the Keekonyokie, Damat, Purko, Wuasinkishu, Siria, Laitayiok, Loitai, Kisonko, Matapato, Dalalekutuk, Loodokolani ,Kaputiei,Moitanik,Ilkirasha, Samburu,Lchamus,Laikipia,Loitokitoki,Larusa,Salei,Sirinket and Parakuyo. Recent advances in genetic analyses have helped shed some light on the ethnogenesis of the Maasai people. Genetic genealogy, a tool that uses the genes of modern populations to trace their ethnic and geographic origins, has also helped clarify the possible background of the modern Maasai. The Maasai's autosomal DNA has been examined in a comprehensive study by Tishkoff et al. (2009) on the genetic affiliations of various populations in Africa. According to the study's authors, the Maasai "have maintained their culture in the face of extensive genetic introgression". Tishkoff et al. also indicate that: "Many Nilo-Saharan-speaking populations in East Africa, such as the Maasai, show multiple cluster assignments from the Nilo-Saharan [...] and Cushitic [...] AACs, in accord with linguistic evidence of repeated Nilotic assimilation of Cushites over the past 3000 years and with the high frequency of a shared East African–specific mutation associated with lactose tolerance." A Y chromosome study by Wood et al. (2005) tested various Sub-Saharan populations, including 26 Maasai males from Kenya, for paternal lineages. The authors observed haplogroup E1b1b in 50% of the studied Maasai, which is indicative of substantial gene flow from more northerly Cushitic males, who possess the haplogroup at high frequencies. The second most frequent paternal lineage among the Maasai was Haplogroup A3b2, which is commonly found in Nilotic populations, such as the Alur; it was observed in 27% of Maasai males. The third most frequently observed paternal DNA marker in the Maasai was E1b1a1-M2 (E-P1), which is very common in the Sub-Saharan region; it was found in 12% of the Maasai samples. Haplogroup B-M60 was also observed in 8% of the studied Maasai, which is also found in 30% (16/53) of Southern Sudanese Nilotes. According to an mtDNA study by Castri et al. (2008), which tested Maasai individuals in Kenya, the maternal lineages found among the Maasai are quite diverse, but similar in overall frequency to that observed in other Nilo-Hamitic populations from the region, such as the Samburu. Most of the tested Maasai belonged to various macro-haplogroup L sub-clades, including L0, L2, L3, L4 and L5. Some maternal gene flow from North and Northeast Africa was also reported, particularly via the presence of mtDNA haplogroup M lineages in about 12.5% of the Maasai samples. 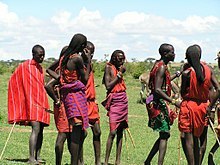 Maasai society is strongly patriarchal in nature, with elder men, sometimes joined by retired elders, deciding most major matters for each Maasai group. A full body of oral law covers many aspects of behavior. Formal execution is unknown, and normally payment in cattle will settle matters. An out-of-court process is also practiced called 'amitu', 'to make peace', or 'arop', which involves a substantial apology. The monotheistic Maasai worship a single deity called Enkai or Engai. Engai has a dual nature: Engai Narok (Black God) is benevolent, and Engai Na-nyokie (Red God) is vengeful. There are also two pillars or totems of Maasai society: Oodo Mongi, the Red Cow and Orok Kiteng, the Black Cow with a subdivision of five clans or family trees. The maasai also has a totemic animal which is the lion however, the animal can be killed. The way the Maasai kill the lion differs from trophy hunting as it is used in the rite of passage ceremony. The "Mountain of God", Ol Doinyo Lengai, is located in northernmost Tanzania and can be seen from Lake Natron in southernmost Kenya. The central human figure in the Maasai religious system is the laibon whose roles include shamanistic healing, divination and prophecy, and ensuring success in war or adequate rainfall. Today, they have a political role as well due to the elevation of leaders. Whatever power an individual laibon had was a function of personality rather than position. Many Maasai have also adopted Christianity and Islam. The Maasai are known for their intricate jewelry and for decades, have sold these items to tourists as a business. A once high infant mortality rate among the Maasai has led to babies not truly being recognized until they reach an age of 3 months ilapaitin. Educating Maasai women to use clinics and hospitals during pregnancy has enabled more infants to survive. The exception is found in extremely remote areas. For Maasai living a traditional life, the end of life is virtually without ceremony, and the dead are left out for scavengers. A corpse rejected by scavengers is seen as having something wrong with it, and liable to cause social disgrace; therefore, it is not uncommon for bodies to be covered in fat and blood from a slaughtered ox. Burial has in the past been reserved for great chiefs, since it is believed to be harmful to the soil. Traditional Maasai lifestyle centres around their cattle which constitute their primary source of food. The measure of a man's wealth is in terms of cattle and children. A herd of 50 cattle is respectable, and the more children the better. A man who has plenty of one but not the other is considered to be poor. A Maasai religious belief relates that God gave them all the cattle on earth, leading to the belief that rustling cattle from other tribes is a matter of taking back what is rightfully theirs, a practice that has become much less common. All of the Maasai’s needs for food are met by their cattle. They eat the meat, drink the milk daily, and drink the blood on occasion. Bulls, oxen and lambs are slaughtered for meat on special occasions and for ceremonies. Though the Maasai’s entire way of life has historically depended on their cattle, more recently with their cattle dwindling, the Maasai have grown dependent on food such as sorghum, rice, potatoes and cabbage (known to the Maasai as goat leaves). A traditional pastoral lifestyle has become increasingly difficult due to outside influences of the modern world. Garrett Hardin's article, outlining the "tragedy of the commons", as well as Melville Herskovits' "cattle complex" helped to influence ecologists and policy makers about the harm Maasai pastoralists were causing to savannah rangelands. This concept was later proven false by anthropologists but is still deeply ingrained in the minds of ecologists and Tanzanian officials. This influenced British colonial policy makers in 1951 to remove all Maasai from the Serengeti National Park and relegate them to areas in and around the Ngorongoro Conservation Area (NCA). The plan for the NCA was to put Maasai interests above all else, but this promise was never met. The spread of HIV was rampant. Due to an increase in Maasai population, loss of cattle populations to disease, and lack of available rangelands because of new park boundaries and the incursion of settlements and farms by other tribes (this is also the chief reason for the decline in wildlife-habitat loss, with the second being poaching), the Maasai were forced to develop new ways of sustaining themselves. Many Maasai began to cultivate maize and other crops to get by, a practice that was culturally viewed negatively. Cultivation was first introduced to the Maasai by displaced WaArusha and WaMeru women who were married to Maasai men; subsequent generations practiced a mixed livelihood. To further complicate their situation, in 1975 the Ngorongoro Conservation Area banned cultivation practices. In order to survive they are forced to participate in Tanzania’s monetary economy. They have to sell their animals and traditional medicines in order to buy food. The ban on cultivation was lifted in 1992 and cultivation has again become an important part of Maasai livelihood. Park boundaries and land privatisation has continued to limit grazing area for the Maasai and have forced them to change considerably. Over the years, many projects have begun to help Maasai tribal leaders find ways to preserve their traditions while also balancing the education needs of their children for the modern world. The emerging forms of employment among the Maasai people include farming, business (selling of traditional medicine, running of restaurants/shops, buying and selling of minerals, selling milk and milk products by women, embroideries), and wage employment (as security guards/ watchmen, waiters, tourist guides), and others who are engaged in the public and private sectors. The central unit of Maasai society is the age-set. Young boys are sent out with the calves and lambs as soon as they can toddle, but childhood for boys is mostly playtime, with the exception of ritual beatings to test courage and endurance. Girls are responsible for chores such as cooking and milking, skills which they learn from their mothers at an early age. Every 15 years or so, a new and individually named generation of Morans or Il-murran (warriors) will be initiated. This involves most boys between 12 and 25, who have reached puberty and are not part of the previous age-set. One rite of passage from boyhood to the status of junior warrior is a circumcision ceremony performed without anaesthetic. In modern times, boys living close to towns with doctors may endure the ceremony in safer conditions, but still without anaesthetic because they must endure the pain that will lead them to manhood. This ritual is typically performed by the elders, who use a sharpened knife and makeshift cattle hide bandages for the procedure. The Maa word for circumcision is emorata. The boy must endure the operation in silence. Expressions of pain bring dishonor, albeit temporarily. Any exclamations can cause a mistake in the delicate and tedious process, which can result in lifelong scarring, dysfunction, and pain. The healing process will take 3–4 months, during which urination is painful and nearly impossible at times, and boys must remain in black clothes for a period of 4–8 months. 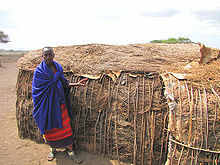 During this period, the newly circumcised young men will live in a "manyatta", a "village" built by their mothers. The manyatta has no encircling barricade for protection, emphasizing the warrior role of protecting the community. No inner kraal is built, since warriors neither own cattle nor undertake stock duties. Further rites of passage are required before achieving the status of senior warrior, culminating in the eunoto ceremony, the "coming of age". When a new generation of warriors is initiated, the existing Il-murran will graduate to become junior elders, who are responsible for political decisions until they in turn become senior elders. This graduation from warrior to junior elder takes place at a large gathering known as Eunoto. The long hair of the former warriors is shaved off; elders must wear their hair short. Warriors are not allowed to have sexual relations with circumcised women, though they may have girlfriends who are uncircumcised girls. At Eunoto, the warriors who managed to abide by this rule are specially recognized. The warriors spend most of their time now on walkabouts throughout Maasai lands, beyond the confines of their sectional boundaries. They are also much more involved in cattle trading than they used to be, developing and improving basic stock through trades and bartering rather than stealing as in the past. One myth about the Maasai is that each young man is supposed to kill a lion before he is circumcised. Lion hunting was an activity of the past, but it has been banned in Southeast Africa – yet lions are still hunted when they maul Maasai livestock, and young warriors who engage in traditional lion killing do not face significant consequences. Increasing concern regarding lion populations has given rise to at least one program which promotes accepting compensation when a lion kills livestock, rather than hunting and killing the predator. Nevertheless, killing a lion gives one great value and celebrity status in the community. Young women also undergo excision ("female circumcision", "female genital mutilation," "emorata") as part of an elaborate rite of passage ritual called "Emuratare," the ceremony that initiates young Maasai girls into adulthood through ritual circumcision and then into early arranged marriages. The Maasai believe that female circumcision is necessary and Maasai men may reject any woman who has not undergone it as either not marriageable or worthy of a much-reduced bride price. In Eastern Africa, uncircumcised women, even those highly educated members of parliament like Linah Kilimo, can be accused of not being mature enough to be taken seriously. To others the practice of female circumcision is known as female genital mutilation, and draws a great deal of criticism from both abroad and many women who have undergone it, such as Maasai activist Agnes Pareyio. It has recently been replaced in some instances by a "cutting with words" ceremony involving singing and dancing in place of the mutilation. However, the practice remains deeply ingrained and valued by the culture. The Maa word for circumcision, "emorata," is used for both female and male genital mutilation. Female genital cutting is illegal in both Kenya and Tanzania. These circumcisions are usually performed by an invited 'practitioner' who is often not Maasai, usually from a Dorobo group. The knives and blades which make the cut are fashioned by blacksmiths, il-kunono, who make their weapons for the Maasai who do not make their own:(knives, short swords (ol alem or simi or seme), spears, etc.). Similarly to the young men, women who will be circumcised wear dark clothing, paint their faces with markings, and then cover their faces on completion of the ceremony. Married women who become pregnant are excused from all heavy work such as milking and gathering firewood. Sexual relations are also banned and there are specific rules applied to pregnant women. The Maasai are traditionally polygynous; this is thought to be a long-standing and practical adaptation to high infant and warrior mortality rates. Polyandry is also practiced. However, today this practice is usually abandoned. A woman marries not just her husband but the entire age group. Men are expected to give up their bed to a visiting age-mate guest; however, today this practice is usually abandoned. The woman decides strictly on her own if she will join the visiting male. Any child which may result is the husband's child and his descendant in the patrilineal order of Maasai society. "Kitala", a kind of divorce or refuge, is possible in the house of a wife's father, usually for gross mistreatment of the wife. Repayment of the bride price, custody of children, etc., are mutually agreed upon. Maasai music traditionally consists of rhythms provided by a chorus of vocalists singing harmonies while a song leader, or olaranyani, sings the melody. The olaranyani is usually the singer who can best sing that song, although several individuals may lead a song. The olaranyani begins by singing a line or title (namba) of a song. The group will respond with one unanimous call in acknowledgment, and the olaranyani will sing a verse over the group's rhythmic throat singing. Each song has its specific namba structure based on call-and-response. Common rhythms are variations of 5/4, 6/4 and 3/4 time signatures. Lyrics follow a typical theme and are often repeated verbatim over time. Neck movements accompany singing. When breathing out the head is leaned forward. The head is tilted back for an inward breath. Overall the effect is one of polyphonic syncopation. Unlike most other African tribes, Maasai widely use drone polyphony. Women chant lullabies, humming songs, and songs praising their sons. Nambas, the call-and-response pattern, repetition of nonsense phrases, monophonic melodies, repeated phrases following each verse being sung on a descending scale, and singers responding to their own verses are characteristic of singing by females. When many Maasai women gather together, they sing and dance among themselves. Both singing and dancing sometimes occur around manyattas, and involve flirting. Young men will form a line and chant rhythmically, "Oooooh-yah", with a growl and staccato cough along with the thrust and withdrawal of their lower bodies. Girls stand in front of the men and make the same pelvis lunges while singing a high dying fall of "Oiiiyo..yo" in counterpoint to the men. Although bodies come in close proximity, they do not touch. Eunoto, the coming of age ceremony of the warrior, can involve ten or more days of singing, dancing and ritual. The warriors of the Il-Oodokilani perform a kind of march-past as well as the adumu, or aigus, sometimes referred as "the jumping dance" by non-Maasai. (Both adumu and aigus are Maa verbs meaning "to jump" with adumu meaning "To jump up and down in a dance".) Warriors are well known for, and often photographed during, this competitive jumping. A circle is formed by the warriors, and one or two at a time will enter the center to begin jumping while maintaining a narrow posture, never letting their heels touch the ground. Members of the group may raise the pitch of their voices based on the height of the jump. The piercing and stretching of earlobes is common among the Maasai as with other tribes. Various materials have been used to both pierce and stretch the lobes, including thorns for piercing, twigs, bundles of twigs, stones, the cross section of elephant tusks and empty film canisters. Fewer and fewer Maasai, particularly boys, follow this custom. Women wear various forms of beaded ornaments in both the ear lobe, and smaller piercings at the top of the ear. Amongst Maasai males, Circumcision is practiced as a ritual of transition from boyhood to manhood. Women are also circumcised (as described above). The removal of deciduous canine tooth buds in early childhood is a practice that has been documented in the Maasai of Kenya and Tanzania. There exists a strong belief among the Maasai that diarrheoa, vomiting and other febrile illnesses of early childhood are caused by the gingival swelling over the canine region, which is thought to contain 'worms' or 'nylon' teeth. This belief and practice is not unique to the Maasai. In rural Kenya a group of 95 children aged between six months and two years were examined in 1991/92. 87% were found to have undergone the removal of one or more deciduous canine tooth buds. In an older age group (3–7 years of age), 72% of the 111 children examined exhibited missing mandibular or maxillary deciduous canines. Traditionally, the Maasai diet consisted of raw meat, raw milk, and raw blood from cattle. Note that the Maasai cattle are of the Zebu variety. In the summer of 1935 Dr. Weston A. Price visited the Maasai and reported that according to Dr. Anderson from the local government hospital in Kenya most tribes were disease-free. Many had not a single tooth attacked by dental caries nor a single malformed dental arch. In particular the Maasai had a very low 0.4% of bone caries. He attributed that to their diet consisting of (in order of volume) raw milk, raw blood, raw meat and some vegetables and fruits, although in many villages they do not eat any fruit or vegetables at all. He noted that when available every growing child and every pregnant or lactating woman would receive a daily ration of raw blood. Dr. Weston A. Price also noted the government efforts back in 1935 to turn the Maasai into farmers. An ILCA study (Nestel 1989) states: "Today, the stable diet of the Maasai consists of cow's milk and maize-meal. The former is largely drunk fresh or in sweet tea and the latter is used to make a liquid or solid porridge. The solid porridge is known as ugali and is eaten with milk; unlike the liquid porridge, ugali is not prepared with milk. Animal fats or butter are used in cooking, primarily of porridge, maize, and beans. Butter is also an important infant food." Studies by the International Livestock Centre for Africa (Bekure et al. 1991) shows a very great change in the diet of the Maasai towards non-livestock products with maize comprising 12–39 percent and sugar 8–13 percent; about one litre of milk is consumed per person daily. Most of the milk is consumed as fermented milk or buttermilk (a by-product of butter making). Milk consumption figures are very high by any standards. The needs for protein and essential amino acids are more than adequately satisfied. However, the supply of iron, niacin, vitamin C, vitamin A, thiamine and energy are never fully met by a purely milk diet. Due to changing circumstances, especially the seasonal nature of the milk supply and frequent droughts, most pastoralists, including the Maasai, now include substantial amounts of grain in their diets. The Maasai herd goats and sheep, including the Red Maasai sheep, as well as the more prized cattle. Electrocardiogram tests applied to 400 young adult male Maasai found no evidence whatsoever of heart disease, abnormalities or malfunction. Further study with carbon-14 tracers showed that the average cholesterol level was about 50 percent of that of an average American. These findings were ascribed to the amazing fitness of morans, which was evaluated as "Olympic standard". Soups are probably the most important use of plants for food by Maasai. Acacia nilotica is the most frequently used soup plant. The root or stem bark is boiled in water and the decoction drunk alone or added to soup. The Maasai are fond of taking this as a drug, and is known to make them energetic, aggressive and fearless. Maasai eat soup laced with bitter bark and roots containing cholesterol-lowering saponins; those urban Maasai who don't have access to the bitter plants tend to develop heart disease. Although consumed as snacks, fruits constitute a major part of the food ingested by children and women looking after cattle as well as morans in the wilderness. The mixing of cattle blood, obtained by nicking the jugular vein, and milk is done to prepare a ritual drink for special celebrations and as nourishment for the sick. However, the inclusion of blood in the traditional diet is waning due to the reduction of livestock numbers. More recently, the Maasai have grown dependent on food produced in other areas such as maize meal, rice, potatoes, cabbage (known to the Maasai as goat leaves) etc. The Maasai who live near crop farmers have engaged in cultivation as their primary mode of subsistence. In these areas, plot sizes are generally not large enough to accommodate herds of animals; thus the Maasai are forced to farm. As a historically nomadic and then semi-nomadic people, the Maasai have traditionally relied on local, readily available materials and indigenous technology to construct their housing. The traditional Maasai house was in the first instance designed for people on the move and was thus very impermanent in nature. The houses are either somewhat rectangular shaped with extensions or circular, and are constructed by able-bodied women. The structural framework is formed of timber poles fixed directly into the ground and interwoven with a lattice of smaller branches wattle, which is then plastered with a mix of mud, sticks, grass, cow dung, human urine, and ash. The cow dung ensures that the roof is waterproof. The enkaj or engaji is small, measuring about 3 × 5 m and standing only 1.5 m high. Within this space, the family cooks, eats, sleeps, socializes, and stores food, fuel, and other household possessions. Small livestock are also often accommodated within the enkaji. Villages are enclosed in a circular fence (an enkang) built by the men, usually of thorned acacia, a native tree. At night, all cows, goats, and sheep are placed in an enclosure in the centre, safe from wild animals. Clothing changes by age and location. Young men, for instance, wear black for several months following their circumcision. However, red is a favored colour. Blue, black, striped, and checkered cloth are also worn, as are multicolored African designs. The Maasai began to replace animal skin, calf hides and sheep skin, with commercial cotton cloth in the 1960s. Shúkà is the Maa word for sheets traditionally worn wrapped around the body. These are typically red, though with some other colors (e.g. blue) and patterns (e.g. plaid). Pink, even with flowers, is not shunned by warriors. One piece garments known as kanga, a Swahili term, are common. Maasai near the coast may wear kikoi, a type of sarong that comes in many different colors and textiles. However, the preferred style is stripes. Many Maasai in Tanzania wear simple sandals, which were until recently made from cowhides. They are now soled with tire strips or plastic. Both men and women wear wooden bracelets. The Maasai women regularly weave and bead jewellery. This bead work plays an essential part in the ornamentation of their body. Although there are variations in the meaning of the color of the beads, some general meanings for a few colors are: white, peace; blue, water; red, warrior/blood/bravery. Beadworking, done by women, has a long history among the Maasai, who articulate their identity and position in society through body ornaments and body painting. Before contact with Europeans, the beads were produced mostly from local raw materials. White beads were made from clay, shells, ivory, or bone. Black and blue beads were made from iron, charcoal, seeds, clay, or horn. Red beads came from seeds, woods, gourds, bone, ivory, copper, or brass. When late in the nineteenth century, great quantities of brightly colored European glass beads arrived in Southeast Africa, beadworkers replaced the older beads with the new materials and began to use more elaborate color schemes. Currently, dense, opaque glass beads with no surface decoration and a naturally smooth finish are preferred. Head shaving is common at many rites of passage, representing the fresh start that will be made as one passes from one to another of life's chapters. Warriors are the only members of the Maasai community to wear long hair, which they weave in thinly braided strands. Two days before boys are circumcised, their heads are shaved. The young warriors then allow their hair to grow, and spend a great deal of time styling the hair. It is dressed with animal fat and ocher, and parted across the top of the head at ear level. Hair is then plaited: parted into small sections which are divided into two and twisted, first separately then together. Cotton or wool threads may be used to lengthen hair. The plaited hair may hang loose or be gathered together and bound with leather. When warriors go through the Eunoto, and become elders, their long plaited hair is shaved off. As males have their heads shaved at the passage from one stage of life to another, a bride to be will have her head shaved, and two rams will be slaughtered in honor of the occasion. Edward Lowassa - Prime Minister of Tanzania from 2005 to 2008. 2nd runner up to president John Pombe Magufuli in the 2015 Tanzania General Elections. ^ a b A. Okoth & A. Ndaloh, Peak Revision K.C.P.E. Social Studies, East African, p.60-61. ^ Robert O. Collins, The southern Sudan in historical perspective, (Transaction Publishers: 2006), p.9-10. ^ S. Wandibba et al., p.19-20. ^ "Maasai Education Discovery". Maasaieducation.org. Archived from the original on 2007-06-06. Retrieved 2012-02-28. ^ International Labour Office, Traditional occupations of indigenous and tribal peoples: emerging trends, (International Labour Organization: 2000), p.55. ^ Sources and methods in African history: spoken, written, unearthed - Toyin Falola - Google Boeken. Books.google.com. Retrieved 2012-02-28. ^ "Ecology Books and Journals". Blackwell Publishing. Archived from the original on 2012-10-03. Retrieved 2012-02-28. ^ "Rinderpest". Ntz.info. 1997-02-14. Retrieved 2012-02-28. ^ Faris, Stephan (19 September 2004). "The Land Is Ours". Time. ^ Kitumusote. "History of the Maasai". Kitumusote. Retrieved 2012-02-28. ^ The myth of wild Africa: conservation without illusion - Jonathan S. Adams, Thomas O. McShane - Google Boeken. Books.google.com. Retrieved 2012-02-28. ^ "Internet Archive Wayback Machine". Web.archive.org. 2007-08-14. Archived from the original on 2007-08-14. Retrieved 2012-02-28. ^ "archived copy of laleyio.com". Web.archive.org. 2008-05-27. Archived from the original on February 12, 2009. Retrieved 2012-02-28. ^ a b Tishkoff, Sarah A.; Reed, Floyd A.; Friedlaender, Françoise R.; Ehret, Christopher; Ranciaro, Alessia; Froment, Alain; Hirbo, Jibril B.; Awomoyi, Agnes A.; Bodo, Jean-Marie; Doumbo, Ogobara; Ibrahim, Muntaser; Juma, Abdalla T.; Kotze, Maritha J.; Lema, Godfrey; Moore, Jason H.; Mortensen, Holly; Nyambo, Thomas B.; Omar, Sabah A.; Powell, Kweli; Pretorius, Gideon S.; Smith, Michael W.; Thera, Mahamadou A.; Wambebe, Charles; Weber, James L.; Williams, Scott M. (2009), "The Genetic Structure and History of Africans and African Americans", Science, 324: 1035–44, doi:10.1126/science.1172257, PMC 2947357, PMID 19407144 Also see Supplementary Data. ^ Cruciani; et al. (May 2004). "Phylogeographic Analysis of Haplogroup E3b (E-M215) Y Chromosomes Reveals Multiple Migratory Events Within and Out Of Africa". Am J Hum Genet. 74 (5): 1014–1022. doi:10.1086/386294. PMC 1181964. PMID 15042509. Archived from the original on 2013-01-12. ^ a b Hassan (2008). "Y-chromosome variation among Sudanese: restricted gene flow, concordance with language, geography, and history". American Journal of Physical Anthropology. 137 (3): 316–23. doi:10.1002/ajpa.20876. PMID 18618658. ^ Castrí (2008). "Kenyan crossroads: migration and gene flow in six ethnic groups from Eastern Africa" (PDF). J Anthropol Sci. 86: 189–92. PMID 19934476. ^ "African water symbolism and its consequences". Institut.veolia.org. Archived from the original on 2007-10-10. Retrieved 2012-02-28. ^ "Maasai"_Tepilit Ole Saitoti 1980 Harry N. Abrams, Incorporated, New York ISBN 978-0-8109-8099-0, 1990 edition. ^ Vries, Manfred F. R. Kets de (2014-06-17). Talking to the Shaman Within: Musings on Hunting. iUniverse. ISBN 9781491731512. ^ "Society-MASAI". Archived from the original on 1997-05-04. Retrieved 2012-02-28. ^ "Kenyan Tribes & Religions | Travel to Africa". www.shadowsofafrica.com. Archived from the original on 2017-12-23. Retrieved 2017-12-22. ^ Cultural and Public Attitudes: Improving the Relationship between Humans and Hyaenas from Mills, M.g.L. and Hofer, H. (compilers). (1998) Hyaenas: Status Survey and Conservation Action Plan. IUCN/SSC Hyaena Specialist Group. IUCN, Gland, Switzerland and Cambridge, UK. vi + 154 pp. ^ a b McCabe, Terrence. (2003). "Sustainability and livelihood diversification among the Maasai of Northern Tanzania". Human Organization. Vol 62.2. pp. 100–111. ^ Goodman, Ric. (2002). "Pastoral livelihoods in Tanzania: Can the Maasai benefit from conservation?" Current Issues in Tourism. Vol 5.3,4. P.280-286. ^ Siyabona Africa. "The Maasai Tribe, East Africa". Siyabona Africa. Retrieved 20 April 2018. ^ "Challenges To Traditional Livelihoods And Newly Emerging Employment Patterns Of Pastoralists In Tanzania" (PDF). Archived from the original (PDF) on 2011-09-24. Retrieved 2012-02-28. ^ "Mashada Forums - View Single Post - Paul Muite...another piece to the Mt. Kenya Mafia jig-s". Mashada.com. 2003-03-20. Archived from the original on 2008-12-04. Retrieved 2012-02-28. ^ "English - Maa". Darkwing.uoregon.edu. Retrieved 2012-02-28. ^ "Maasai Association". Maasai Association. Retrieved 2012-02-28. ^ Tribal Odyssey - Maasai: The Last Dance Of The Warriors (Motion picture). National Geographic. 2005. ^ "Maasai People, Kenya". Maasai-association.org. Retrieved 2012-02-28. ^ "Field Reports: Maasai tribesmen help lions rather than kill them". Bigcatrescue.blogspot.com. 2007-07-06. Retrieved 2012-02-28. ^ "Maasai Ritual of Female Circumcision: Genital Cutting Practiced throughout Africa and Middle East". Orato.com. Archived from the original on 2011-08-07. Retrieved 2012-05-05. ^ "In-depth: Razor's Edge - The Controversy of Female Genital Mutilation". IRIN Humanitarian News and Analysis, UN Office for the Coordination of Humanitarian Affairs. March 2005. Retrieved 2012-05-05. ^ "tan007 Tanzania fails to enforce law against female mutilation". Afrol.com. Retrieved 2012-02-28. ^ "The Abolition of Female Genital Mutilation —". Infoplease.com. Retrieved 2012-02-28. ^ Spencer, P. (1988) The Maasai of Matapato: a study of rituals of rebellion Manchester University Press, Manchester. Spencer, P. (2003) Time, Space, and the Unknown: Maasai configurations of power and providence. Routledge, London. ^ "ilMurran" (in Finnish). ilMurran. 1999-12-04. Archived from the original on 2007-04-28. Retrieved 2012-02-28. ^ "Maasai Music (archived copy)". Web.archive.org. 2008-05-27. Archived from the original on November 4, 2011. Retrieved 2012-02-28. ^ "Homophonic". Music.vt.edu. 2011-11-17. Retrieved 2012-02-28. ^ "What is monophony, polyphony, homophony, monody etc.?". Medieval.org. Retrieved 2012-02-28. ^ "Song Structure of Maasai Music (archived copy)". Web.archive.org. 2008-05-27. Archived from the original on February 26, 2005. Retrieved 2012-02-28. ^ "Maa - Categories". Darkwing.uoregon.edu. Retrieved 2012-02-28. ^ "Archived copy of laleyio.com". Web.archive.org. 2008-05-27. Archived from the original on August 2, 2011. Retrieved 2012-02-28. ^ The Myth of Wild Africa, Google Books. ^ Hassanali J, Amwayi P, Muriithi A (Apr 1995). "Removal of deciduous canine tooth buds in Kenyan rural Maasai". East Afr Med J. 72 (4): 207–9. PMID 7621751. ^ Hiza JF, Kikwilu EN (Apr 1992). "Missing primary teeth due to tooth bud extraction in a remote village in Tanzania". Int J Paediatr Dent. 2 (1): 31–4. doi:10.1111/j.1365-263x.1992.tb00005.x. PMID 1525129. ^ "The technology of traditional milk products in developing countries". Fao.org. Retrieved 2012-02-28. ^ Suttie, J.M. "Livestock as food for pastoralists in Africa". Archived from the original on 11 March 2009. ^ "Ethnobotany of the Loita Maasai: towards community management of the Forest of the Lost Child; experiences from the Loita Ethnobotany Project; People and plants working paper; Vol. :8; 2001" (PDF). Retrieved 2012-02-28. ^ "Maasai". Junior Worldmark Encyclopedia of World Cultures. 1999. Archived from the original on 2012-07-08. ^ "Maa (Maasai) Dictionary". Darkwing.uoregon.edu. Retrieved 2012-02-28. ^ "Kanga history". Glcom.com. Retrieved 2012-02-28. ^ "East Africa Living Encyclopedia". Africa.upenn.edu. Retrieved 2012-02-28. ^ "Klumpp 1987, 105, 30, 31, 67". Smithsonianeducation.org. Retrieved 2012-02-28. 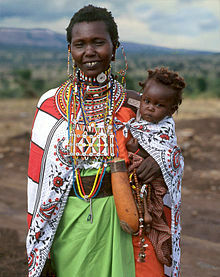 Wikimedia Commons has media related to Maasai.